Three bedroom terraced house in central village location within walk of amenities and with front and rear garden and garage. EPC rating D. DESCRIPTION Take a look at this three bedroom terraced house set over three levels in a popular location in this sought after village. 17 The Glebe is sure to have great appeal to first time buyers, for retirement or as a buy-to-let investment due to its convenient position and pretty but low maintenance courtyard style garden. The property also has the benefit of double glazing and gas fired central heating. Full accommodation comprises; Living room, kitchen, conservatory, three bedrooms and family bathroom. Within a walk to amenities and also offering front and rear garden and garage, we highly recommend an early viewing of this highly convenient and practical home. EPC rating D.
DIRECTIONS From Amor Stores in the centre of the village, proceed along Broad Street into Station Road. After you've passed the church, take the left hand turn immediately after the vet's surgery on the left hand side and 17 The Glebe can be found set back from the road on the left hand side. WE HAVE NOTICED What an opportunity for a first time buyer, buy to let investor or indeed a downsizer. This property has a pretty but manageable garden and is located within a walk to the amenities of the village, making it a highly convenient and practical buy. We also love the loft bedroom with its dual aspect skylight windows - perfect for guests or teenagers wanting their own space! PORCH Electric fuse box, spotlights to ceiling, wood effect laminate flooring. LOUNGE 14' 9" x 9' 10" (4.5m x 3m) Upvc double glazed window to front aspect, TV point, radiator, large under stairs storage cupboard, wood effect laminate flooring. KITCHEN 12' 11" x 7' 6" (3.94m x 2.29m) Upvc double glazed window to conservatory, metal door with obscure panels to conservatory, range of cream gloss wall and base units with wood effect roll top work surfaces, Beko electric oven, induction hob and extractor, integrated fridge, freezer and wall mounted 'Worcester' gas boiler, sink and drainer with mixer tap, radiator, tiled flooring. CONSERVATORY 10' 11" x 6' 9" (3.33m x 2.06m) Of upvc and double glazed construction with patio doors to garden and full height windows to either side, polycarbonate roofing, radiator, laminate flooring. FIRST FLOOR LANDING Spotlights to ceiling, doors to all rooms. MASTER BEDROOM 13' 0" x 12' 3" (3.96m x 3.73m) Upvc double glazed window to front in bay style. sliding mirrored door to wardrobe, door to shelved storage space, radiator. BEDROOM THREE 6' 8" x 6' 4" (2.03m x 1.93m) Upvc double glazed window to rear aspect, radiator. 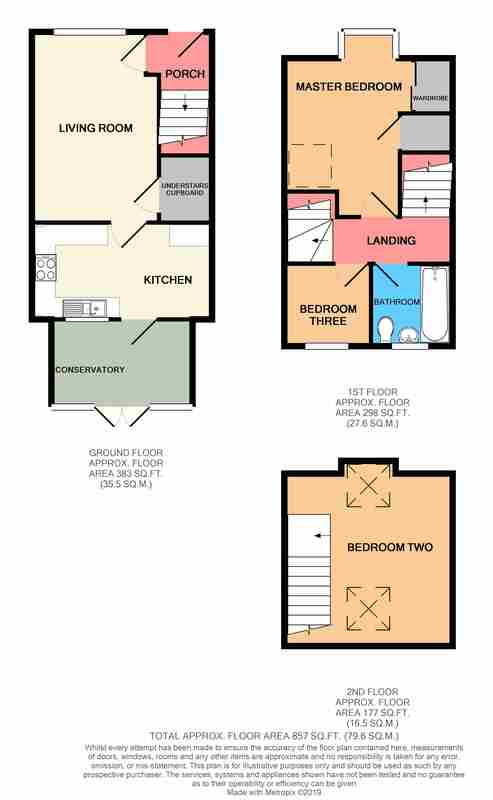 BATHROOM 6' 4" x 5' 11" (1.93m x 1.8m) (max) Obscure upvc double glazed window to rear aspect, white and chrome suite of low level WC, pedestal sink with mixer tap, panelled bath with mixer tap and Triton electric shower over, tiled surround, laminate flooring. BEDROOM TWO 13' 3" x 12' 11" (4.04m x 3.94m) Two skylight windows to rear and front aspects, three doors to eaves access, TV point, radiator, spotlights to ceiling. OUTSIDE The front garden is laid to a brick path with gravelled areas to sides, housing a mature tree to the front of the plot. The rear garden has a decked area with space for seating with the remaining space laid to astro turf making an ideal child friendly space, or perfect for lazy gardeners. Both sides are bordered by fencing.